Semantic Elements in HTML5 is the use of HTML markup to reinforce the semantic/meaning of the information in webpages and web applications rather than merely to define its presentation or look which can’t be done via non-semantic elements i.e. div,span, etc. 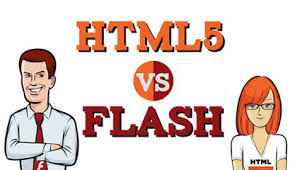 This helps in processing faster as browser gets to know the purpose by the element whereas no such functionality in flash Amount of processing power required to run HTML5 is considerably lower than Flash given the fact that more number of people are using mobile devices. Designers are also aiming to create different versions of websites for PC and mobile (Stripped down version).